The Hydrostone has established itself as a culinary destination in the city's north end. With the legendary Salvatore's, the consistently excellent Epicurious Morsels and the decadent Julien's Bakery, the strip is a haven for foodies. The new kid on the block is a member of the rapidly growing Hamachi sushi empire, Hamachi Kita ("Kita" meaning "north"). Hamachi Kita is small, with a take-out counter at the far end of the long, narrow dining room. One wall has a fantastic undersea mural, much like the one at the Hamachi House flagship. Minimalist decor is in keeping with the Japanese theme. Tucked into a corner table, we pass over the extensive sushi menu to order from the lunch specials, a tempting array of both Japanese and Thai-inspired dishes. Our gyoza ($6.95) arrive steaming hot with soy dipping sauce. The little pan-fried dumplings are stuffed with a pork and vegetable mixture, and are fragrantly delicious. The miso soup, which comes with the lunch special entree, is very good. The mainstay of Japanese soups, miso tends to be salty in varying degrees. This version is on the lower end of that spectrum, and very palatable because of that. 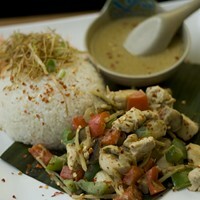 neutrality of the rice and freshness of the salad greens. It's a good, slow burn, but not the kind that destroys your taste buds, leaving you unable to enjoy the rest of the meal. I love the Bento box. Bento boxes refer to meals for one and the containers in which they come. Boxes range from very plain to very elaborate, and the food is always an assortment of items, elegantly arranged and delightful to the eye as much as the mouth. 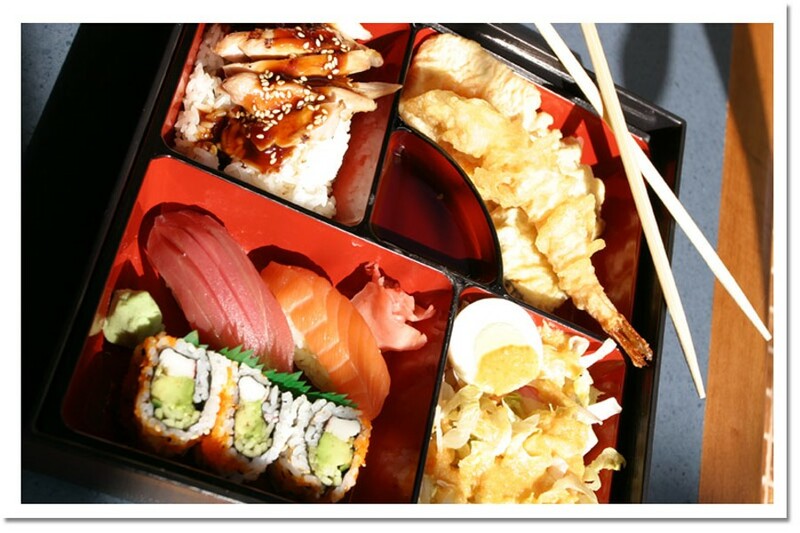 In this case, Hamachi serves it up in a beautiful lacquered black and red compartmentalized box. Delicate vegetable tempura, salmon and California rolls, sticky rice, salad and beef teriyaki are artfully arranged. All tastes as good as it looks with one minor quibble—the beef is a little tough. Chopsticks and our relative inexperience with them prevent us from eating our food as fast as we'd like but I love the fact that no other cutlery is offered: if you're going for the experience, frankly, you may as well go all the way. For dessert, we share an order of deep-fried mango ice cream ($5.95)—our server's recommendation. It's a large ball of ice cream lightly coated with panko crumbs (very fine Japanese bread crumbs) and quickly fried. I'm not really a fan of deep-frying ice cream, but this dish is executed expertly with a delicate crispy golden crust over the just-melting frozen treat. Happily, we're provided spoons, because we might have been stabbing each other in the hand with the chopsticks trying to get the last bite. Hamachi Kita has only been open since mid-September, typically far too early in the restaurant's lifespan for me to be doing a review. But given this restaurant's pedigree, the polished service, and high culinary standard, I think Hamachi Kita was born ready for a review. Visit all the Hamachis, and more restaurants reviewed by Liz Feltham at foodcritic.ca.